Bittersweet debut for Spain in EJC. The game, between the current champion and the organizer, appeared tough and interesting. After a short and pleasant opening ceremony, with an introduction of the different contestant countries, the game began with the French team kicking. In spite of being the first to attack, Spain wasn't the first to score as France could do it with just 2 plays after the punt return. In the first play, France's quarterback long connected with a receiver setting the First & Goal situation, where Steven Joacin scored by running into Spain's end zone. As the pat wasn't good, the box score shown 0 - 6 after France's first drive.But this was not the established script, since from the next drive until the end of first 15 minutes, Spain's offense dominated France. With it, Spain scored a Field Goal (by Jorge Ortiz) setting 3 - 6 in the box score. 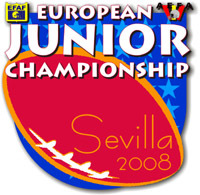 Later Spain's quarterback, Sergui Gonzalo, connected with Joan Bartra a 19 yards pass, and plus the field goal made by Jorge Ortiz, the first quarter ended up 10 - 6. In the second quarter France reacted, and closed the gap with a Field Goal made by Jeff Alexander. Poul Braizas and Mickael Doukure scored two more touchdowns, both by running. So we reached the half time with 22 - 10 for the French team. In the third quarter, Jeff Alexander extended the difference by a 39 yard field goal. After that Spain scored 7 points with a touchdown pass from Mats Jonnson to Daniel Bleso and the extra point. But with another rushing touchdown, this time by Jerry Fernandez, and its extra point France set again the 15 points difference. In the last quarter Spain offered excitement with a passing touchdown to Joan Bartra, and the 2 points conversion, setting the score to 25 - 32. But France ran over spanish hope with two more rushing touchdowns (Nil Chevrier and Maxime Sprauel), ending the game with 25 for Spain and 45 for France.